This is a collection of essays published in honor of Juana Raasch, a Benedictine nun and scholar of mysticism. I've only read one of the contributions, “Temple and Throne of the Divine Glory” by Hieromonk Alexander Golitzin. It's actually a critical essay. Golitzin, an Orthodox bishop and scholar, defends the Macarian Homilies against Raasch and Irenée Hausherr, a Jesuit who pioneered Western academic studies of Eastern Christian spirituality. 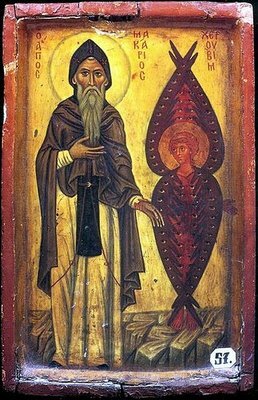 The Macarian Homilies, traditionally attributed to the 4th century Egyptian saint Macarius the Great, were written by an unknown mystic in Syria. Many still believe that “Pseudo-Macarius” was really a heretic, one of the so-called Messalians, condemned by several Church councils. This position was also taken up by Raasch and Hausherr. The Messalians were accused of repudiating the sacraments and Church hierarchy in favor of their form of mysticism. They were also believed to preach various bizarre notions similar to Manicheanism. Especially controversial was the idea that humans can literally see or experience God already in the present life. It's interesting to note that the later Hesychasts were accused of Messalianism. Apparently, Raasch and Hausherr also made a connection between Pseudo-Macarius and the modern charismatic revival (which they strongly opposed). By contrast, Golitzin believes that Ps-Macarius was Orthodox, or at least orthodox enough not be condemned as an outright heretic. His article is essentially a defense of the Macarian Homilies against the charges of Messalianism. Since Golitzin supports the Hesychasts and believes you can see/experience God in this life, his defense of the homilies is really also a defense of Hesychasm, albeit he never explicitly says so.